Whenever the topic of Scholars American Bistro and Cocktail Lounge comes up in conversation, I try to casually mention that I was there on the night it opened. You see, on those exceptionally rare occasions when I have an opportunity to portray myself as a hip guy with his finger on the pulse of Boston nightlife, I seize it. The truth, though, is that my attendance at Scholars’ grand opening was dumb luck. My sister forwarded me an e-mail she’d received about this new bar, thinking I’d like it. Intrigued, I led some office mates there on a Friday after work, and as fate would have it, Scholars had officially opened its doors just a few hours earlier. My coworkers applauded my good taste and seemed impressed with my social-scene savvy – a notion I did little to dispel. 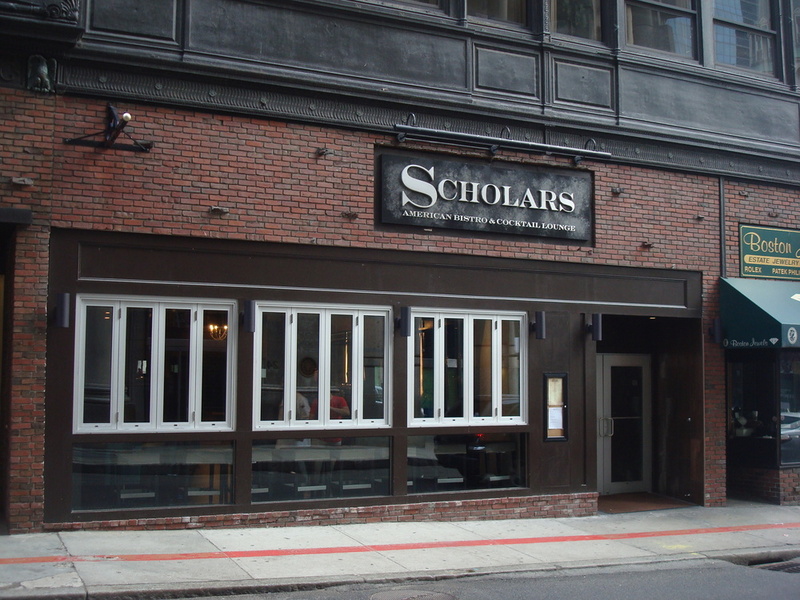 The first thing you might notice about Scholars is how freakin’ big it is for a downtown Boston bar. Having taken over a building that was once a Talbots store, the space occupies two floors and could easily accommodate 200,000 drinkers plus staff (or maybe a little less). The interior feels fresh, new, and refined, with dark carpeting and hardwood flooring, and stonework and mirrors on the walls. The huge staircase leading upstairs adds to its overall sense of grandeur. On the first floor is a long, beautiful bar, and plenty of tables and booths if you’re dining. A little further in is something akin to a lounge. A cozy area with couches and other cushy chairs, it gives off the air of a den built for the express purpose of sipping scotch and smoking cigars. You won’t be doing the latter here, but it’s perfect for relaxing and having a good conversation. Still feeling a little crowded? Head upstairs! It’s a whole ‘nother world up there. You’ll find a second bar, smaller than the downstairs one. 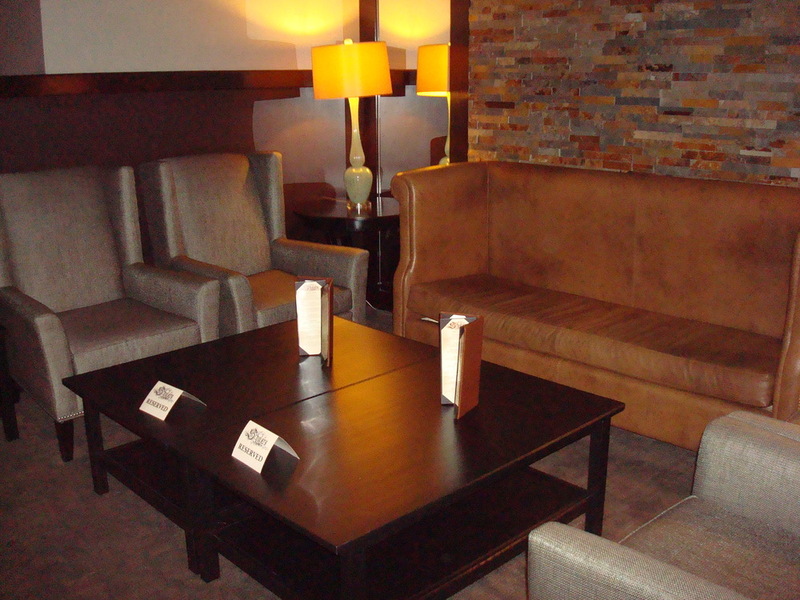 This one’s almost like a hotel bar, with low lighting and a more intimate atmosphere. The bar itself is illuminated, which gives it the appearance of a warm, inviting beacon in this otherwise dark environment. There’s also a balcony overlooking the main bar area. This space is sometimes reserved for parties, but if no one’s using it, it’s a great place to sit and watch the happenings on the floor below. And finally (yes, there’s more), there’s a billiards area with four pool tables and a row of big, leather shoeshine chairs. Whatever inspired someone to put shoeshine chairs in a bar, I’ll never know; though they’re pretty comfortable. But Scholars is much more than just a pretty space. It has an extensive draft beer selection, chock full of microbrews and traditional favorites. In addition to a few seasonal offerings, such as Goose Island Mild Winter, there are a couple of top-notch Belgians and some local favorites, like Fisherman’s Ale and the ultra-popular Pretty Things Baby Tree. The bottled beer selection is even more impressive, with a few especially unusual choices like Lexington Kentucky Bourbon Barrel Ale and Wells Banana Bread Beer (yes…tastes just like it). If you’re not in a beer mood, feast your eyes on Scholars’ cocktail list, which can stand up to that of any bar in the city. The drink menu is divided into four sections, the titles of which play off the “scholarship” theme: Home Room, History Class, Study Group, and Field Trips. The drinks correspond loosely to the headings; under “History Class” are aptly named offerings such as the 1822 and the Boston Tea Party (with a house blend peach tea infusion). The selections under “Study Group,” appropriately, are all available in pitchers. The food menu is unlike any bar I’ve been in (then again, this isn’t merely a bar…it’s a bistro). You won’t be scarfing down nachos and wings here. The most conventional offering on the appetizer menu is Fried Pickles. After that, it ranges from unusual – White Fish Fritters, Lump Crab and Spinach Dip, Tuna Tartare – to borderline exotic: Rabbit Cakes en Salmoreji, Beef Tongue Pate. If you’re not feeling that daring, the Four Cheese Empanadas might be a safer bet. The culinary adventures continue with the entrée menu, which manages to put a modern twist on even some of the most traditional dishes. I’m dying to try the Stuffed Meatloaf. The Fish ‘N’ Chips comes with jalapeno haddock, lime parmesan frites, and smoked paprika tartar sauce. Then there’s the Pork Belly Gnocchi; as I’m writing this, I find myself wondering why I haven’t ordered it yet. Then again, I have yet to make it past the Apple-Cashew Chutney Burger. 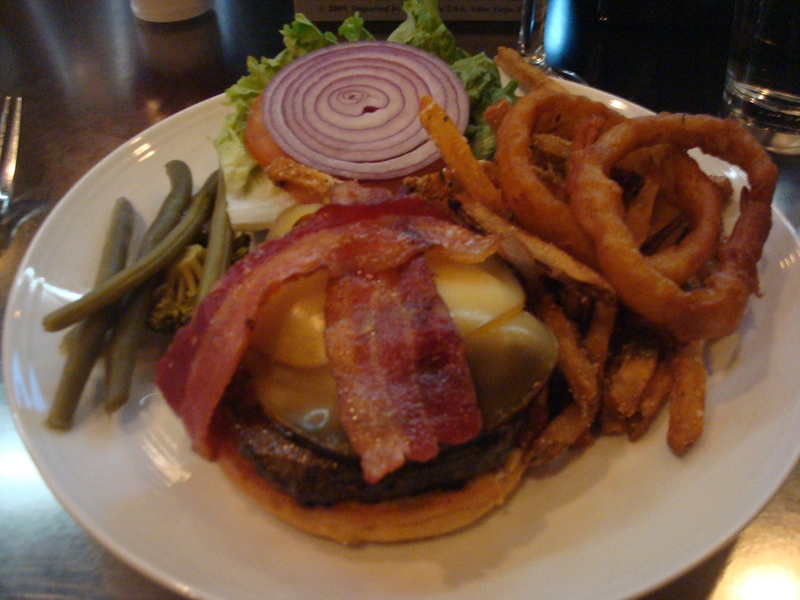 Topped with smoked gouda and applewood-smoked bacon, accompanied by parmesan steak fries, this gourmet burger always manages to sway me from some of those funkier options. While Scholars has become a regular after-work place for me, I was recently here on a Saturday night with my friend and fellow barhopper, Brian. At 7 p.m., the bar was gradually filling up, but we easily got a couple of seats. My evening began with a couple of cocktails. First up – the Van Halen-inspired Rye Can’t This Be Love, a whiskey-based concoction with Cointreau and nicely balanced fruit overtones. Pretty good, but the real prize was the Independence Day – cognac, Cointreau, champagne, a raw sugar cube, and Peychaud’s bitters. 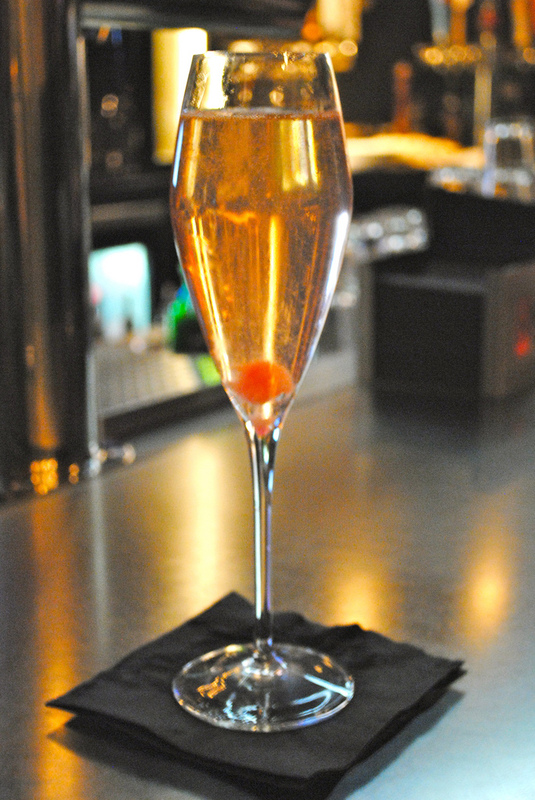 It was smooth and highly drinkable, with the champagne seeming to elevate the flavors of the other ingredients. The evening sufficiently under way, it was time to explore the beer list. I ordered a Cisco Bailey’s Blonde, and I was pleasantly surprised when the bartender offered me a sample, cautioning me that it was a strong ale and unlike most blondes. You know, something like that goes a long way, especially in a place like this. Maybe at, say, Boston Beerworks, you’d figure the staff would be obligated to describe and opine on their beers, because that’s their main draw. Scholars has a lot more than its beer list going for it, but this showed me that the bartender knew her stuff and cared about my order. 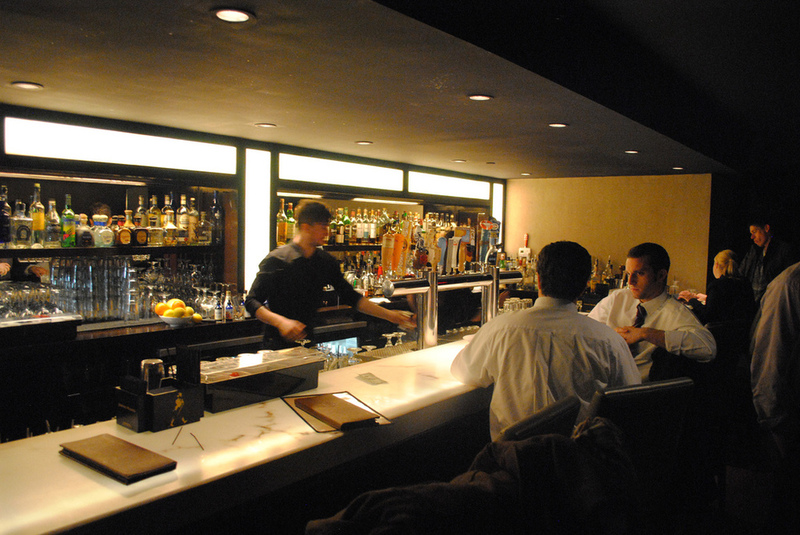 It’s an upscale bar, but that doesn’t mean there’s a snooty attitude. Extra credit for you, Scholars! Anyway, she was totally right about the beer. The sample didn’t do it for me so I opted for the Geary’s Hampshire Special Ale, an excellent Portland beer that Brian was already wisely drinking. I got my customary burger. (I’ll try something else next time – I promise.) Brian got the Margharita pizza and was suitably impressed. He said it would be better without the oregano, but he had no complaints. After dinner, we headed upstairs for a friendly game of pool. The tables aren’t regulation size, but unless you’re a serious billiards enthusiast, who cares? They’ve got cool-looking black felt, a subtle complement to the low-lit surroundings. Pool costs $15 an hour during peak hours, $12 on non-peak hours. It’s free after 10 p.m. on Sunday, Monday, and Tuesday (and bully for you if you’re out shooting pool after 10 p.m. on Sunday, Monday, or Tuesday; some of us have to work in the morning). I returned to Scholars on a Wednesday after work, about a week and a half later, figuring I should sample another cocktail or two to round out this post. I sought out the bartender who’d been so helpful on Saturday. Her name is Amber, and she’s the full-time bartender here. She remembered me from my last trip, either because I was such a pleasant customer or because I was the only weirdo taking pictures of his food and drinks. We got to chatting (and by chatting, I mean me pestering her with questions, which she patiently and cheerfully answered while doing things she actually gets paid for, like making drinks and training a new bartender). It turns out that Amber’s beer knowledge is nothing compared to her cocktail wizadry. I asked if she had any recommendations, and she directed me to a drink called the Living Waters. It’s a mix of Hennessy, Fernet Branca (Amber's favorite liqueur), St. Germain, two types of bitters, and a marinated cherry. Amber confessed that the bar was out of Hennessy, but pledged to make me an equally satisfying version. She also traded the cherry for a spear of three cranberries that had been marinated in Grand Marnier and sugar. The result was heavenly. A sweet and strong cocktail that looked as good as it tasted. Scholars even manages to put a unique twist on something as basic as a gin and tonic. 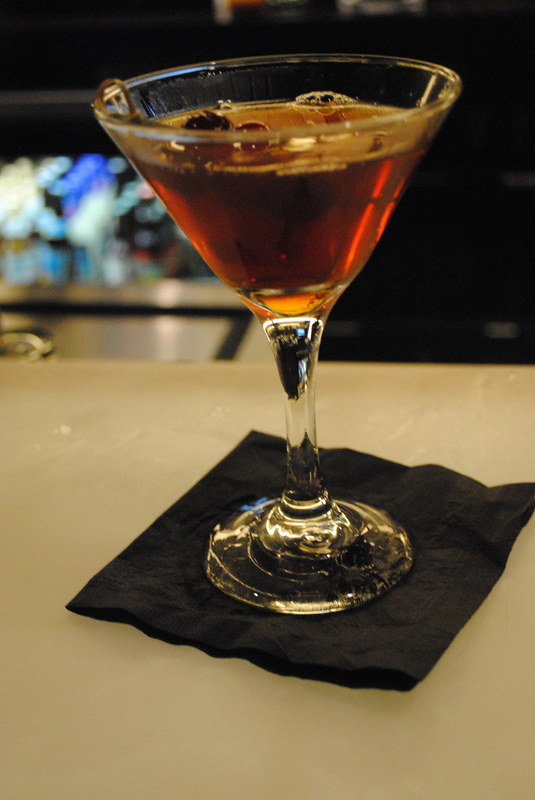 The Scholars Gin & Tonic features a house-made syrup, which gives the drink a taste and color you wouldn’t expect. 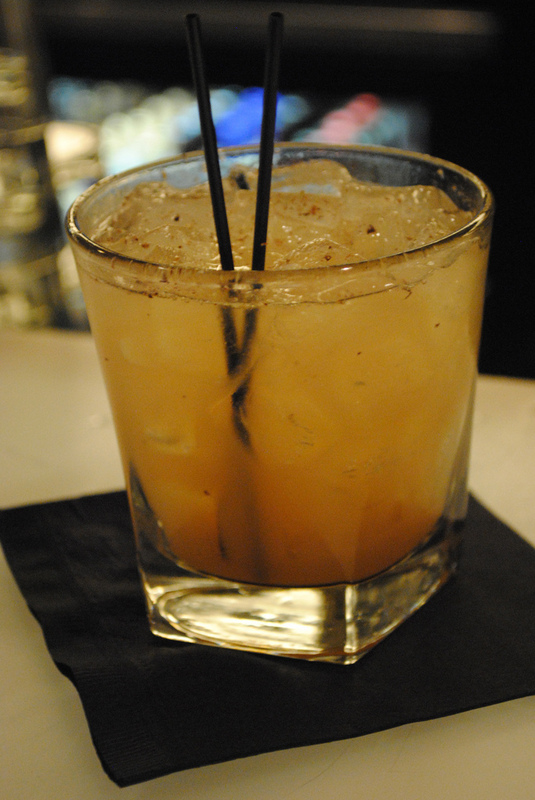 A dusting of nutmeg completes the drink. When a simple cocktail like this can surprise me, I consider it a success. But what really blew me away was the fact that while she was making the drinks, Amber used a stirring straw to extract a small amount of the cocktail, sample it, and continue her work (don’t worry, she threw the straw away). This happened in the span of about one second; if you blinked, you’d miss it. But it made me feel like I was being served by a bartender who genuinely cared about her craft and wouldn’t give me a cocktail that she wouldn’t drink herself. Seriously, how often do you see that? Given its convenient downtown location by the Old State House, Scholars draws a sizable after-work crowd. I’ve never had to wait for a table when I’m eating, but by 5:30 or so on my most recent visit, there were only a couple of open seats at the bar. The scene changes as night falls, particularly on the weekends, with the well-dressed professionals giving way to a stylish younger crowd. There’s a $5 cover starting around 9:30 or 10 on Fridays and Saturdays, whenever the DJ shows up; by 11, house music booms for those looking to get their groove on. So depending on what you’re looking for, it’s a good place to end your day…or to continue your night. At Scholars, the efforts at sophistication are evident in everything from the ambiance to the menu. Eschewing neon beer signs for chandeliers, Budweiser for microbrews, and potato skins for pot stickers, this place certainly isn’t aiming for the pub crowd. Still, it manages to have a pretty broad appeal. That’s because the owners of Scholars use every inch of its palatial size to great advantage. You can mill about with the masses at the bar or cool your heels in the lounge area. 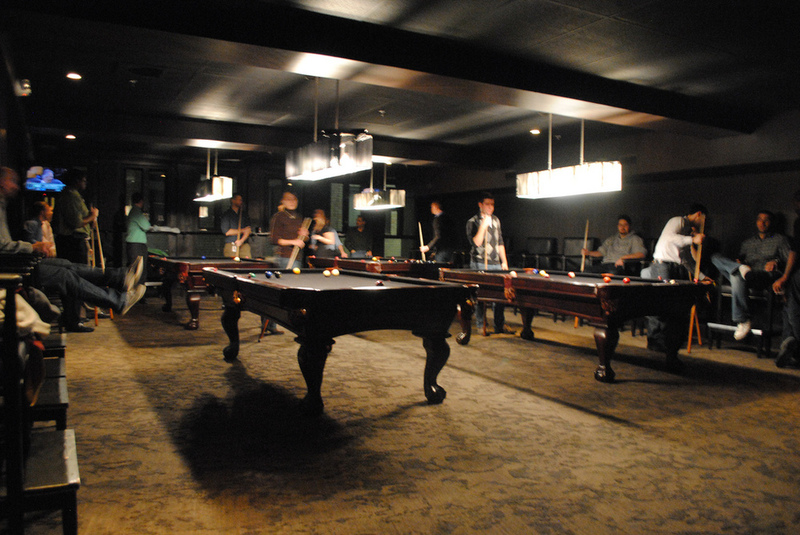 If the weekend night house music isn’t your thing, you can play pool upstairs and enjoy a completely different vibe. If you’re going with a group, there are multiple areas you can reserve and enjoy some relative privacy. 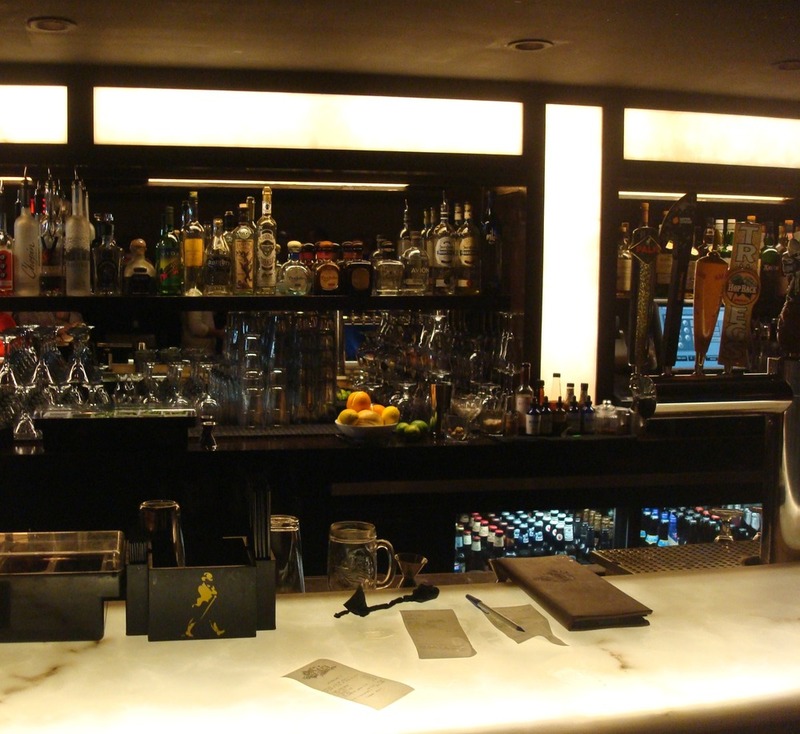 Scholars isn't an ordinary bar, so don't make your visit there ordinary. There are intriguing beers to try, fantastic cocktails to enjoy, and a bold menu to choose from. Like me, you'll probably need more than one trip to appreciate everything this bar has to offer.